[320left]With a 15-cent weekly decrease, Ohio ($2.13) has the largest drop in the region and the country on the week. Motorists in Kansas (-13 cents), Kentucky (-13 cent), Nebraska (-13 cents), Missouri (-13 cents), Illinois (-12 cents), Michigan (-12 cents), Indiana (-12 cents), Iowa (-11 cents), South Dakota (-11 cents), Wisconsin (-10 cents) and North Dakota (-10 cents) all saw double-digit price drops at the pump to kick-off the week. 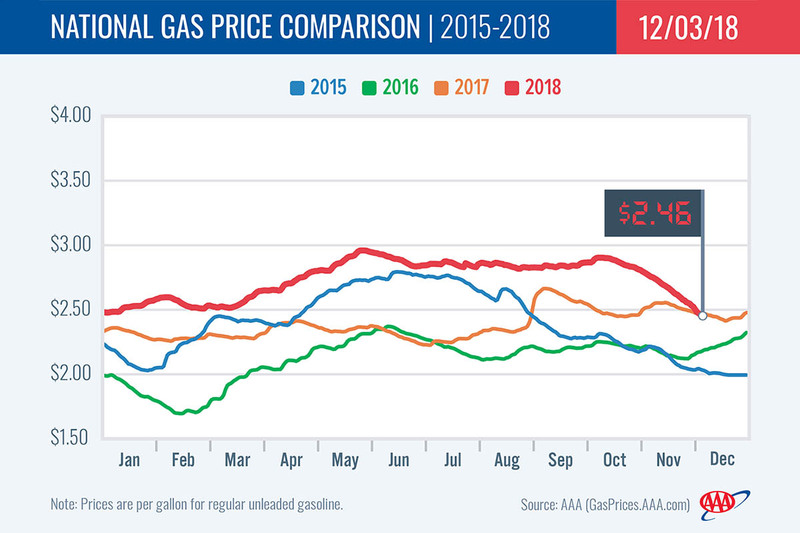 Gas prices are not only cheaper on the week, but also less expensive compared to a month and a year ago across the South and Southeast region. Month-over-month, motorists are seeing the largest savings – up to 30 cents or more/gallon: Oklahoma (-39 cents), Georgia (-37 cents), Arkansas (-36 cents), Texas (-35 cents), Alabama (-35 cents), Mississippi (-35 cents), Louisiana (-34 cents), South Carolina (-34 cents), Florida (-31 cents) and New Mexico (-29 cents). To boot, every state in the region has at least a few stations selling regular unleaded for $2/gallon or less. At $2.20, Delaware has the cheapest gas price average of any state in the Mid-Atlantic and Northeast region. 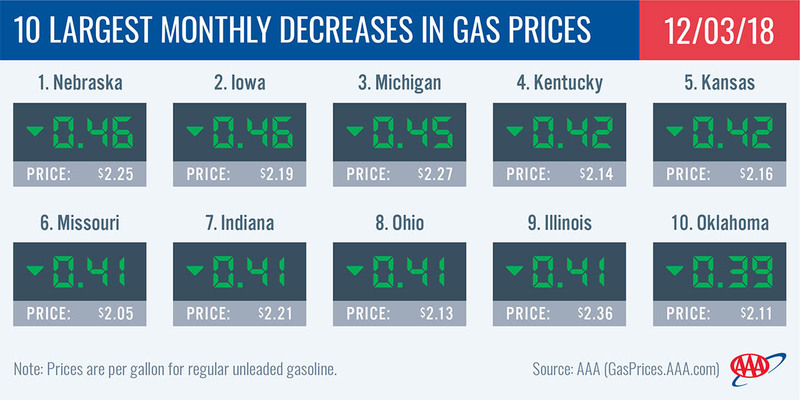 It also has the third largest year-over-year difference in pump prices in the country. [320right]Including Delaware (-18 cents), only seven states in the region have pump prices cheaper today than a year ago: Maryland (-9 cents), Maine (-6 cents), Pennsylvania (-6 cents), North Carolina (-2 cents) New Jersey (-2 cents) and Virginia (-2 cents). Vermont (+15 cents) has the largest year-over-year difference in prices. Pump prices in the West Coast region remain among the highest in the nation, with all of the region’s states landing on the nation’s top 10 most expensive list. [320left]Hawaii ($3.64) is the nation’s most expensive market, followed by California ($3.53), Washington ($3.30), Alaska ($3.22), Nevada ($3.15), Oregon ($3.12), and Arizona ($2.80). While expensive, they are getting cheaper with all state averages being lower on the week: Hawaii (-11 cents), California (-8 cents) and Washington (-6 cents) saw the largest drops. At the close of Friday’s formal trading session on the NYMEX, WTI dropped to settle at $50.93. Crude prices continued to fall last week, reaching their lowest point since October 2017. The drop in price has many market observers speculating that at this week’s OPEC meeting on December 6th in Vienna, Austria, the cartel, alongside Russia, will announce a reduction in crude production, aimed at raising the global price of crude. The exact impact on global prices will be determined by how severe the production cut is and how long the reduction agreement will be held in place. In related news, this morning, Qatar announced it would withdraw from OPEC to develop and increase its natural gas production. The withdrawal will likely not have a huge impact on production as Qatar accounts for just under two percent of OPEC total output.